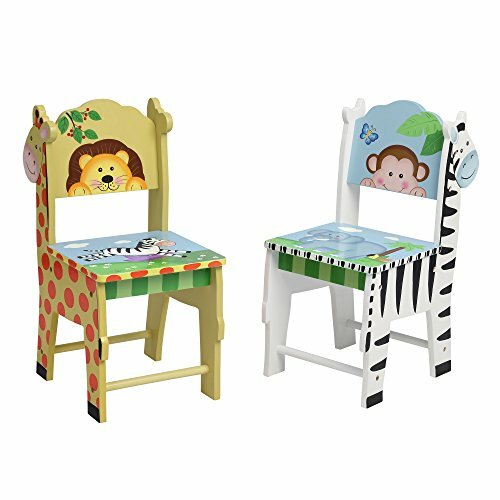 Fantasy Fields Chairs Set of 2, White/Yello/Multi-Color, 13" x 11.5" x 26.75"
Bring fun and learning to live with Fantasy Fields' sunny safari chair! have your child identify and Count the beautiful hand painted animals as they sit on their very own hand crafted seat. The smiling animals and colorful Sentiment of the chair promote creativity and will spark your little one's imagination. Some assembly required. Perfect for ages 3 and up. Sturdy wooden structure made with sturdy, lead-free, eco-friendly MDF (CARB-P2) and non-toxic water-based paint. Hand painted by Skilled Craftsmen. Carefully packaged. A perfect addition to kids bedroom and playroom with whimsical pieces that help develop imagination and creativity. Sturdy chair legs made of solid wood instead of MDF. Tested for stability. Weight limit: 100 lbs. Per chair. Estimated assembly time: 15 mins. Packaged with step-by-step assembly instruction. If you have any questions about this product by Fantasy Fields, contact us by completing and submitting the form below. If you are looking for a specif part number, please include it with your message.